I think they play "April 9th" both on April 9th and September 11th. 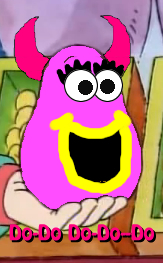 "Hide and Snake / Muffy's New Best Friend" was on today, yay! I really enjoy "Hide and Snake", not exactly sure why, but it's fun to watch. "Muffy's New Best Friend" is amusing in parts, but it does have a good overall message to it that you can be best friends, and not necessarily share the same interests, or like to do the same things. "Hide and Snake"/"Muffy's New Best Friend" is one of my favorites. In "Hide and Snake," I like it when they're in the bathroom, and the lights turn off. Arthur says that the power went out, but Brain says he's sorry, that he leaned on the switch, and then he does it again. I also like it when Buster and Binky are eating, and Buster says, "Well, he's not in the fridge. What happened?" Yes, I also like the moral of "Muffy's New Best Friend." 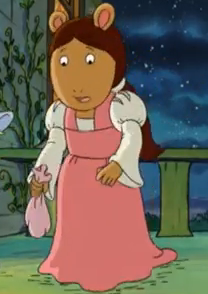 I wonder why we don't see Muffy test Arthur? And in "Sue Ellen Moves In," didn't Arthur say that Muffy and Prunella were best friends? Not that you can't have more than one best friend. It was so refreshing to see "Mom and Dad Have a Great Big Fight / D.W.'s Perfect Wish" today, this is one of my favorite episodes as a whole, both entries are among the more realistic situations that little kids would face; I like how in the former, neither Arthur or D.W. can understand what their parents are arguing about (just hearing blah-blahs), but each of their imaginations over-reacting as to what could possibly happen now that their parents seemingly hate each other. As for the latter, I think just about all little kids, at one age or another, go through what D.W. went through, as to worry about what the next big step in growing up will be like, even though I think Emily overly dramatized it a little too much for D.W. anyway. It's just too bad that D.W. couldn't remain five though, there's a LOT of potential for her to move on to the next level; going to kindergarten would probably mean she'll be attending Lakewood Elementary, and when that happens, you KNOW she'll continuously go out of her way to embarrass Arthur any chance she gets, meanwhile, if she ends up in some kind of trouble, Arthur's big brother instincts would kick in and he would certainly come to her defense. What's weird for me was that when season 3 was fairly new, I rarely watched it because a lot of the stories I thought were mediocre. But today I decided to watch "Mom Had a Great Big Fight"/"D.W.'s Perfect Wish." I wanted to hear the reasons that Arthur and D.W. said their parents would have to fight. Arthur said because D.W. was a pain and she put her peas under the plate. D.W. said because Arthur didn't practice the piano enough and he wore glasses. And I liked the part where D.W. was telling Arthur that she was playing Confuse the Goose with Nadine, and Arthur interrupts her and asks her if she could play with Nadine how come D.W. wanted Arthur to play with her, and D.W. said it was because she and Nadine tie at everything. D.W. dreading turning five because she'll never be a little kid again in "D.W.'s Perfect Wish" is suspiciously similar to the Full House episode "Happy Birthday, Babies, Part 1" where Michelle wants her fifth birthady to be canceled because she wants to be a baby forever. Both episodes involve flashbacks.